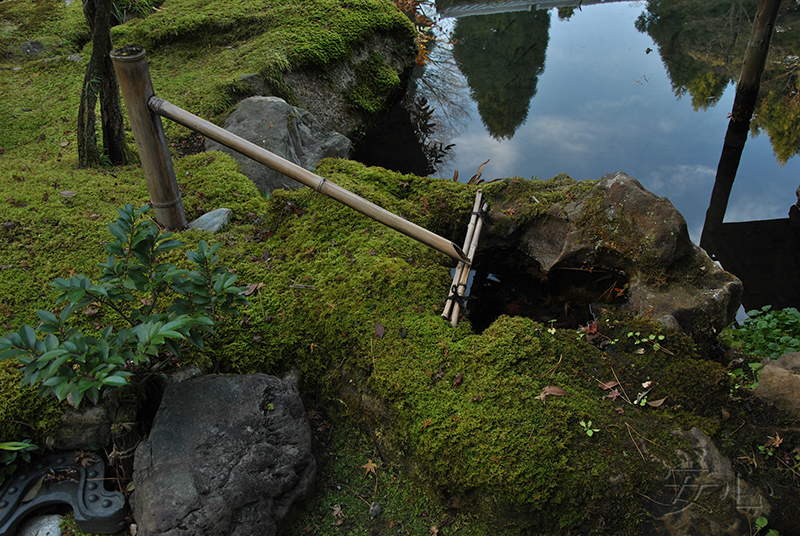 Water and Water basins in Japanese gardens. 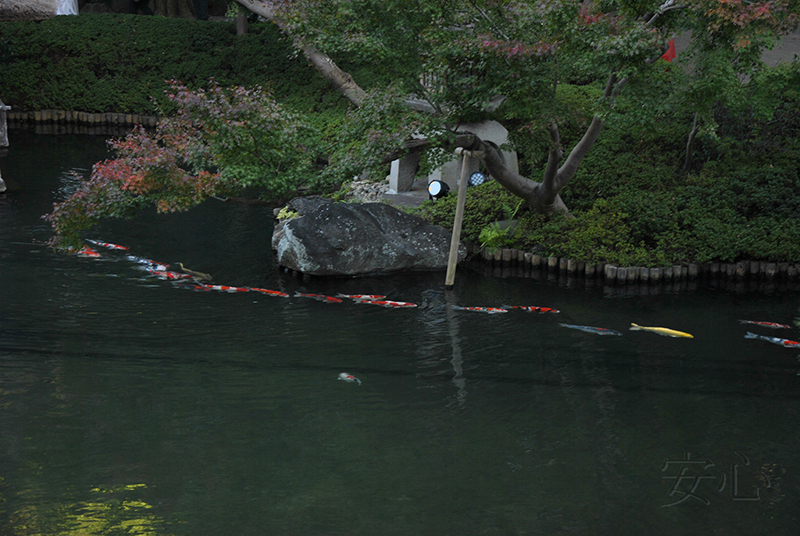 The water together with the stones from the ancient times was defined by the Japanese. Water sources were considered as habitat for aquatic deities, and they were fenced by a rope. Temples were often located near these places. 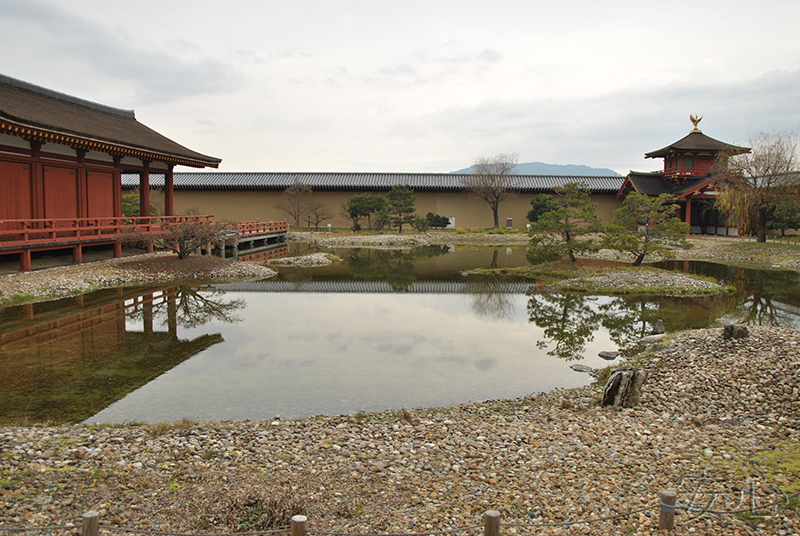 Paradoxical as it may seem, the first ponds were rectangular (Asuka Period). 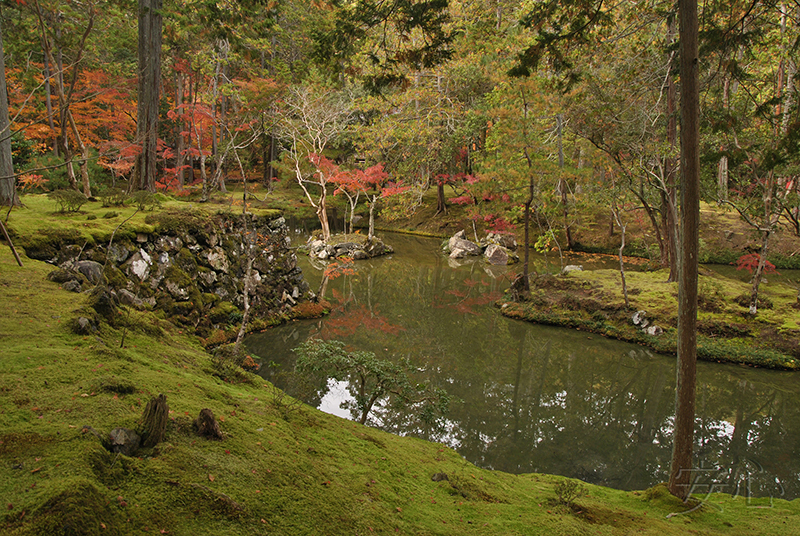 However, in the Nara period, when China's influence increased, the shape of ponds became more sophisticated; they were joined by streams and supplemented by the islands. However, in the Nara period, when China's influence has increased, the shape of ponds has become more sophisticated, they were joined by streams and supplemented by islands. 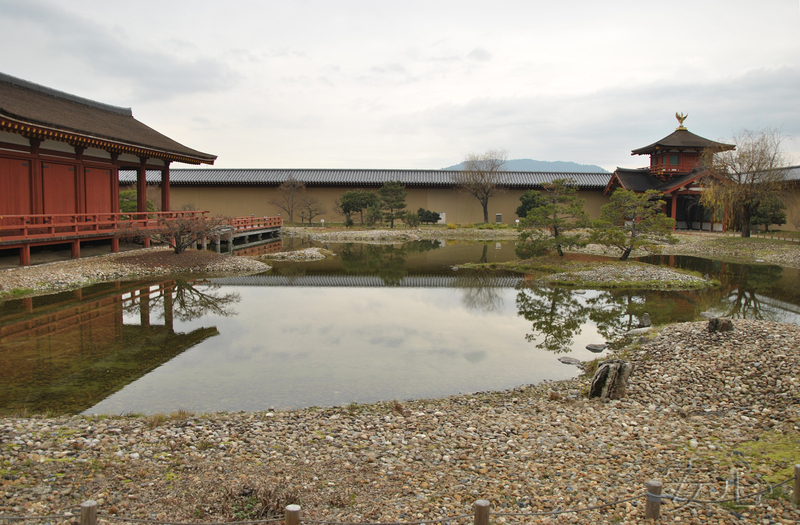 The history of the art of creating ponds went on developing in the Heian period, when the main source of entertainment for the nobility began to be boat sailings. The first rules for pond creating appeared in those times. For example, the water should flow from the east to the west, the shape of the pond should have specific forms (often it was a form of an hieroglyph, which meant something positive). The islands were also endowed with philosophical meaning. Thus, the island Horai symbolizes the pure land, an ideal world, the island of immortality and eternal happiness. To reach this island is not an easy task for the common people, so there are no bridges and walkways. Cranes and turtles are ancient Japanese symbols of longevity and immortality, and as such, find incorporation within garden designs from the earliest times in the form of rocks and islands. The turtle embodies the idea of knowledge and wisdom. Usually these islands are flat. The crane symbolizes the purification of the soul, and his island should be high. Besides, the Immortals, who populated the Mystic Isles, traveled from island to island on the backs of giant cranes, so they came to be closely associated with good fortune and happiness. Also, Turtle and Crane are the symbol of the unity of the two principles, male and female, as the yin-yang. If Turtle seeks to comprehend the depth of the universe, the Crane, by contrast, strive upwards, representing a spiritual perfection. 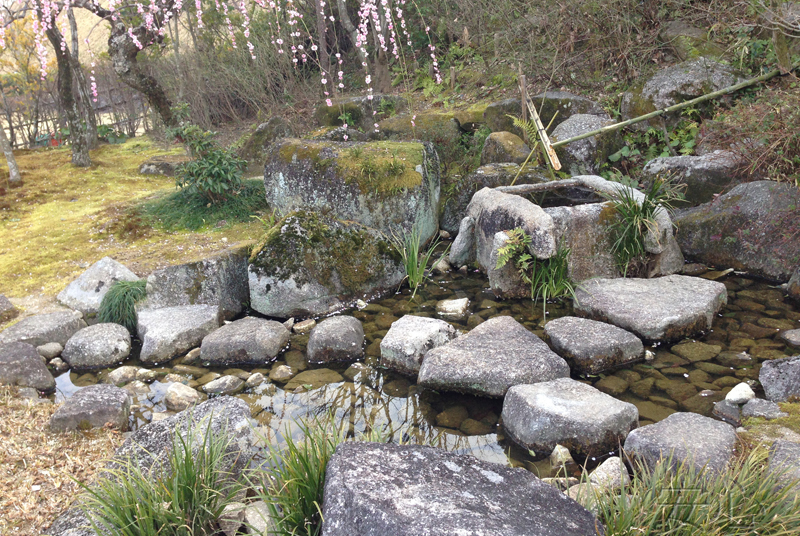 Ponds and water bodies can be a nice decoration of a Japanese garden of your own. Still water would create the sense of calm and serenity. The current streamlet, or at least a trickle of water, by contrast, would create the impression of movement and dynamics. If you plan a large pond, you can breed koi carp, which are very popular in Japan. 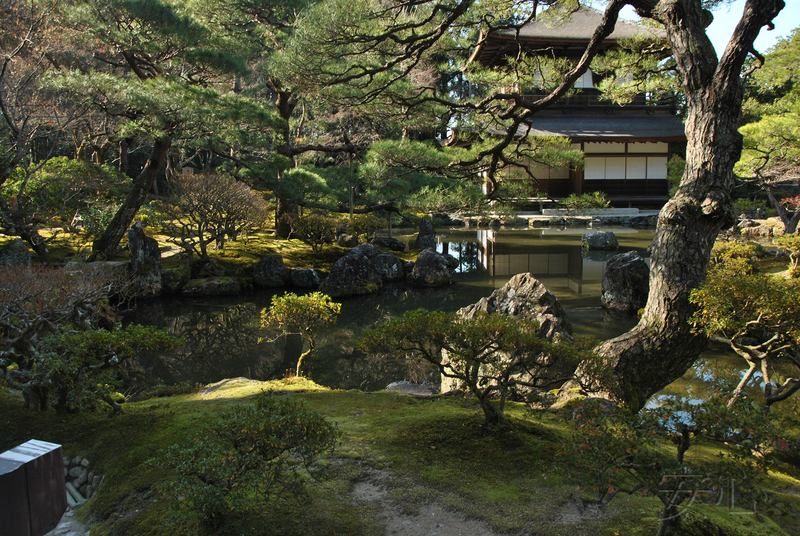 Thus, it is impossible to imagine a Japanese garden without water. However, this does not mean that it is necessary to create a large pond, a stream, or a waterfall. 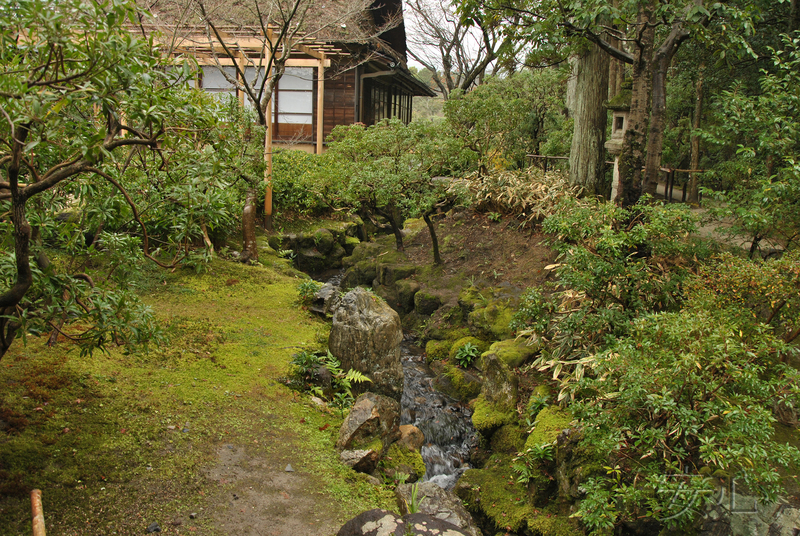 Japanese gardens are often created in small spaces. 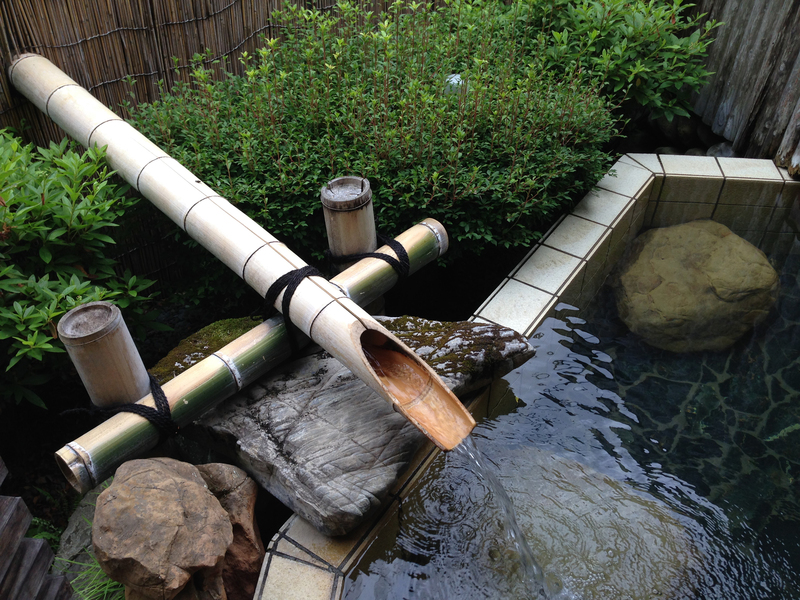 In such cases it would be appropriate to make either a small water basin, tsukubai or a shishi-odoshi. 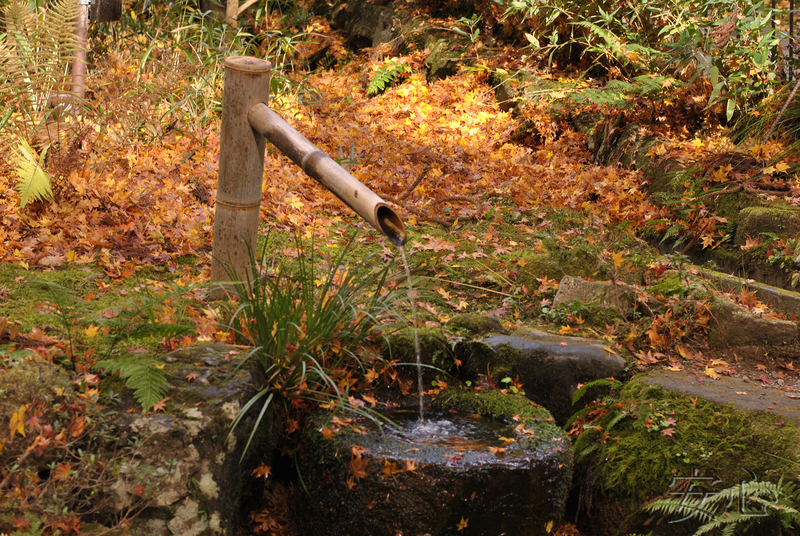 Tsukubai is a place where guests make "cleansing by water", bending over or crouching in front of the bowl. Originally it was just a stone with a recess for water and another stone to which a man stood. However, over time, it included two more stones, to the right and to the left. On one of them shoud be put a candlestick with a candle, the other one was for a container with hot water. 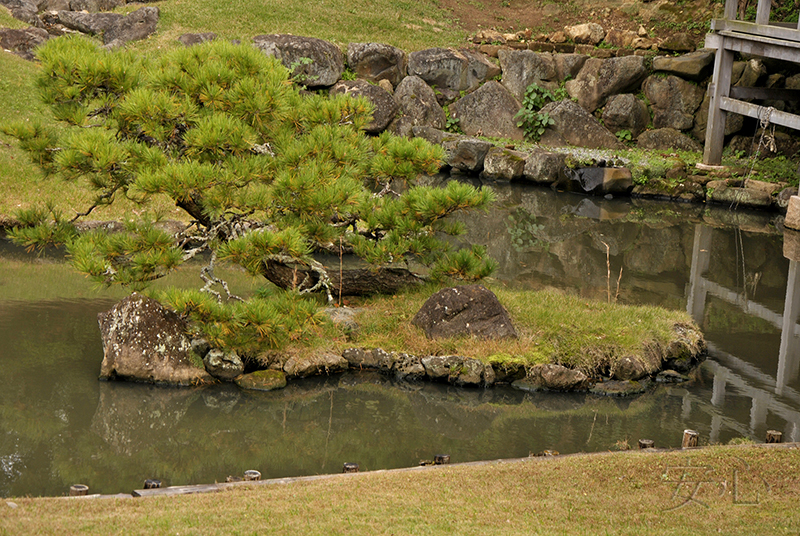 The composition, as a rule, was supplemented by a stone lantern (Oribe), as well as trees and shrubs. 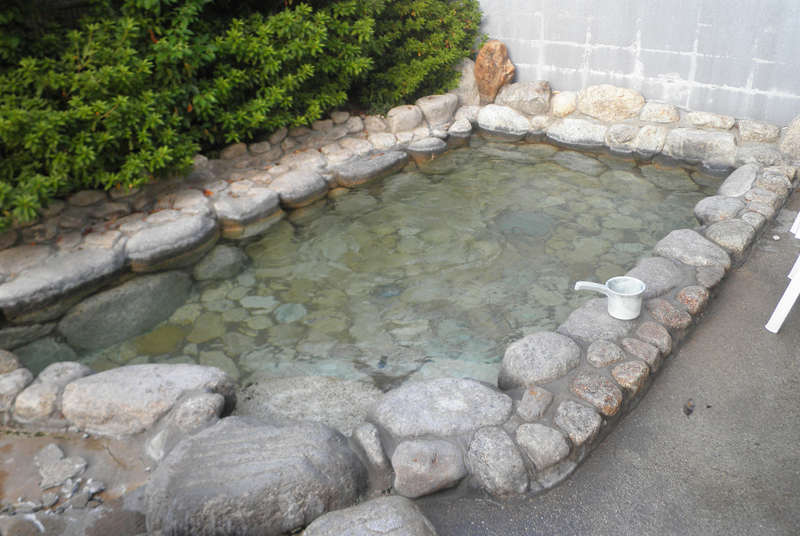 The bowl itself is called chozubachi, a "water pool for hands". As a rule, it is very simple and made of natural stone with a hollowed hole in the center. According to the form, chozubachi can be round, square or generally irregular in shape, if an untreated stone is used instead of a bowl. In accordance to Chinese symbols, the circle represents the sky, and the square represents the earth. Tsukubai belongs to the tea gardens. The water in it is intended for ritual ablutions before the tea ceremony. Each guest must bend over the bowl (usually the height of the bowl is small), scoop the water and rinse his hands. Usually, the chozubachi is set low enough that each participant of the ceremony has to bend over it. This is an expression of humility. Then the guest should draw water again and wash the mouth and face. Before the guest passes the scoop to another member of the tea ceremony, he should tilt the scoop in a special way and drain the rest of the water. From the above, tsukubai is better used in the small gardens, preferably near the gazebo or veranda of home, where you can arrange a tea party or tea ceremony. Although in Japan you can see tsukubai away from buildings. Another interesting water device we can find in Japanese gardens is shishi-odoshi. Surely you remember it well by the movie "Kill Bill" (the fight scene in a Japanese garden). 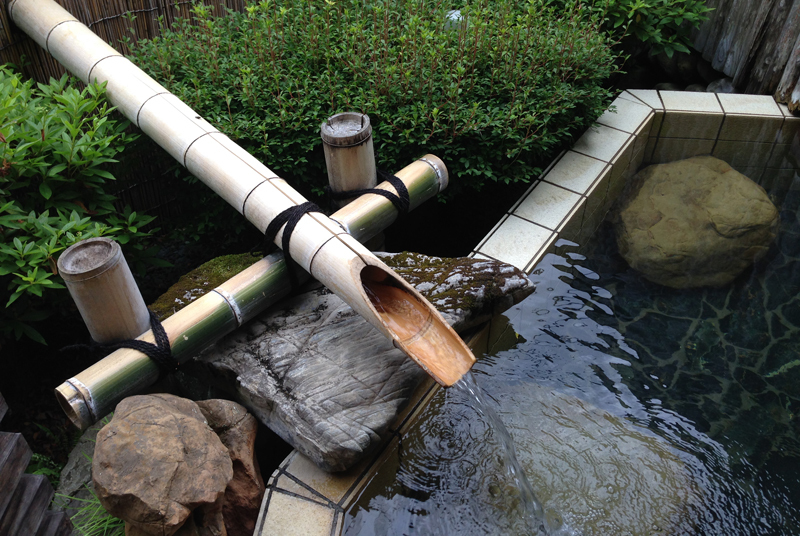 In this device the water climbs up the bamboo chute, pours out of it and flows into the other chute. Under the weight of the liquid the second bamboo tube goes down and strikes the stone with a thud. Water is poured out, and the empty bamboo chute rises again. 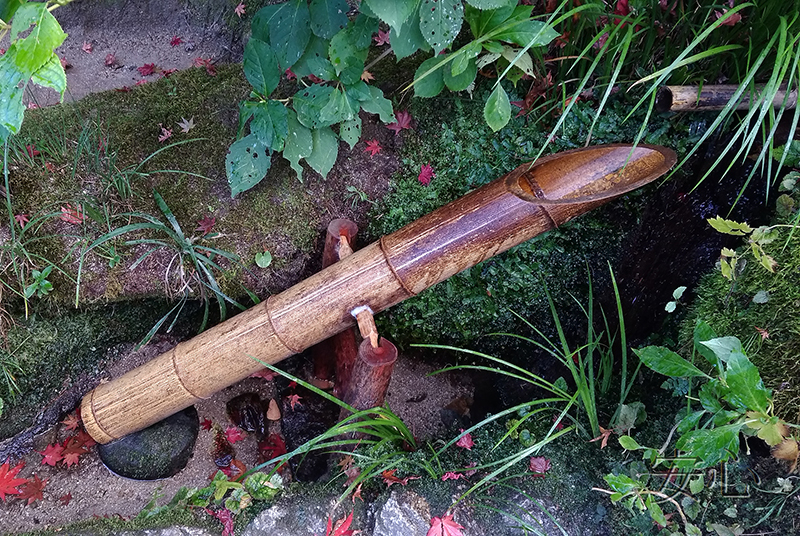 Shishi-odoshi not only fills the garden with interesting sounds as a gurgling trickle, the sound of bamboo chute, but it is also pleasure to watch flowing water, which has a calming effect. At first this device was intended to scare away deer, wild boars and other animals who could cause damage to agriculture. 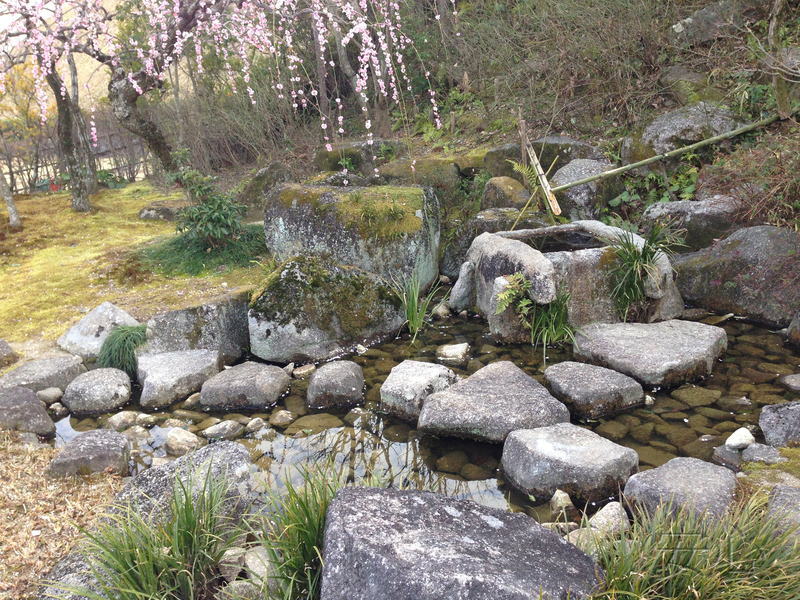 But later, shishi-odoshi began to appear not only in farms but also in the gardens of the temples. It may have another meaning such as scaring away evil spirits. So, if you create a part of the garden in Japanese style, you can decorate it in such an element. But do not place it where you already have tsukubai, rock garden, or graveled space. 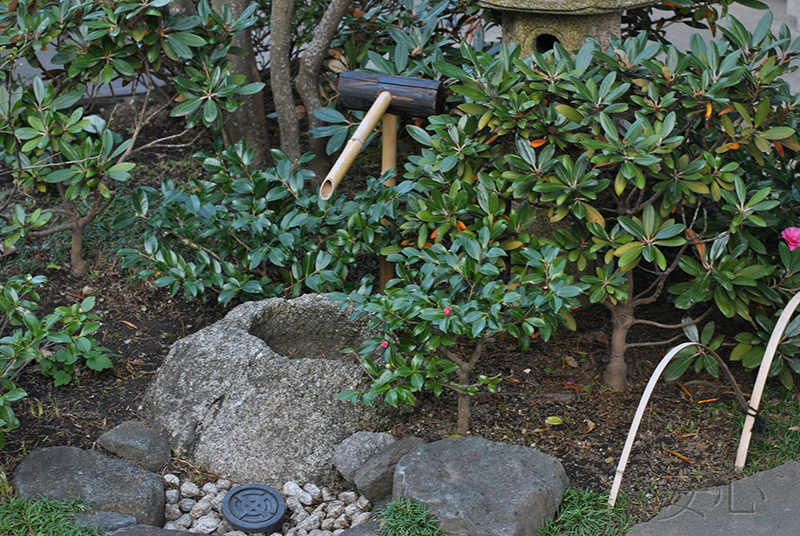 It is best to install the shishi-odoshi in a quiet corner, surrounded by shrubs and perennials. I would like to mention another water basin. You've probably heard about the onsen, the so-called Japanese baths. 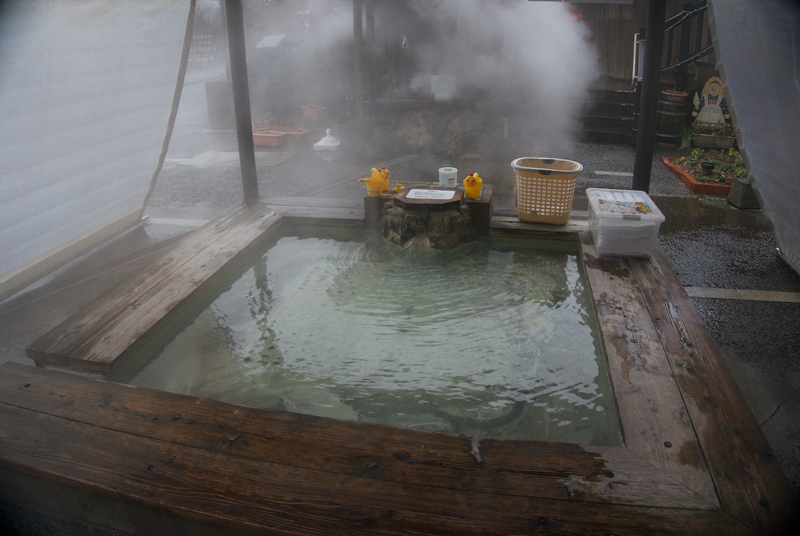 As a rule, onsens are situated not far from hot springs with the healing water. Of course, it is difficult and expensive to create such a pool in Russia. 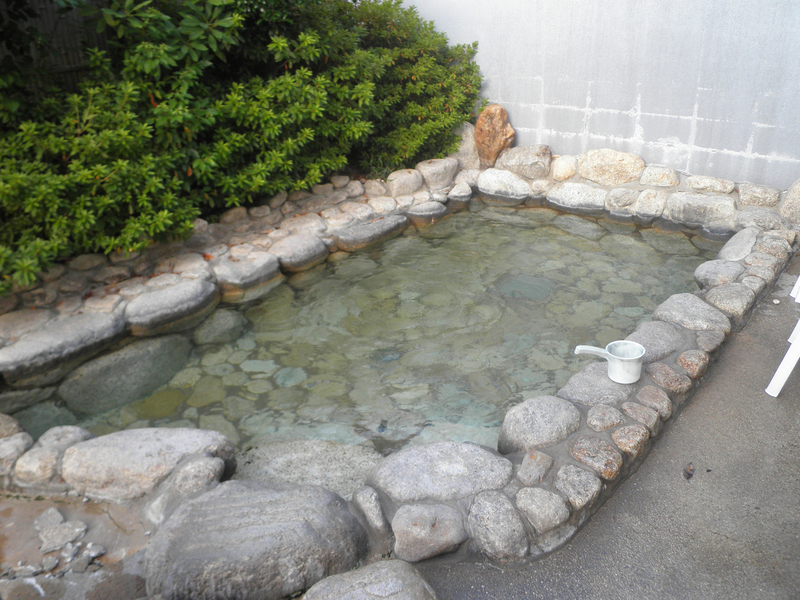 But if you want a small pool, it is quite possible to stylize it as a Japanese onsen. For example, like we did in this garden. We have made a wooden flooring around a small basin, and we place some stones and plants around. or entirely made of stone, what you can also do in your garden. Authors of the photo: Yuichi Azuma, Elena Glubokovskih, Alexandra Basova, Gleb Uspensky, Natalia Revich.